Crews from the county garage worked throughout the day Wednesday clearing roads in the north end of the county, making roadways passable again. The primary tool for this task is a grader with a claw attachment that makes quick work of large logs. 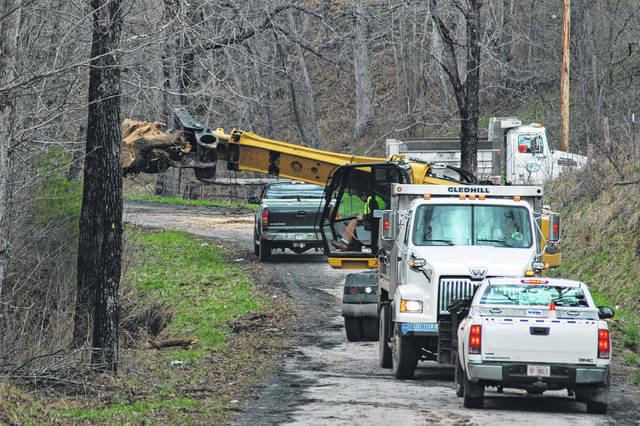 GALLIA COUNTY — Tuesday evening into Wednesday morning, a storm swept through Gallia County, reeking havoc and causing property damage. The concentration of the damage is in the north end of the county, south and east of the village of Vinton. The county garage had crews out along Clark Chapel Road, Mount Tabor road, Summitt Road, and surrounding areas removing substantial trees and debris from roadways. According to Gallia Emergency Management Agency (EMA) the damage was largely mitigated to trees and blocked roadways with the exception of one house on Clark Chapel, which sustained substantial damage to the roof. American Red Cross was already on scene before noon Wednesday to assist the family. EMA also contacted the National Weather Service requesting a site survey to determined whether or not a tornado had actually occurred in the area, as was rumored. Sherry Daines, Gallia EMA Director, said the NWS personnel concluded that a tornado did not occur in Gallia County, although straight line winds reaching 70 mph and hail did occur. While the storm occurred overnight Wednesday, it only served to add to the already saturated ground and increase the water level in the rivers and streams. As of 4 p.m. on Wednesday, the following roads in Gallia County had high water and were closed. Ohio 554 between Ohio 160 and 7, Ohio 850 between Ohio 588 and 554, Ohio 233 between Ohio 141 and the Jackson County line, Ohio 141 between Ohio 233 and the Lawrence County line, Scenic Drive at Ohio 160, Ohio 325 north and south of Vinton, Bullaville Pike at Campaign Creek, Creekview Road at Cora Mill, CH&D Road at Shafer road, Coal Valley Road, Ingalls Road, Double Creek Road, Woodsmill Road by Ohio 325 and near Red’s Carry Out, and Spruce Street Extension in Gallipolis. According to the NWS the crest of the Ohio River at Point Pleasant is expected to be Friday afternoon around 2 p.m. at 42 feet which is at the minor flood stage – flood stage is 40 feet. Robert C Byrd it is expected to be 48.9 feet on Friday afternoon at 2 p.m. which is at the action stage – flood stage is 50 feet. Raccoon Creek is still rising at a current level of 18.53 feet.